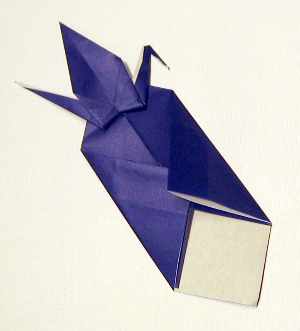 I was inspired by models in a very old book, Noshi - Classic Origami in Japan by Isao Honda. It's made with a single piece of paper, no glue, and just two cuts. 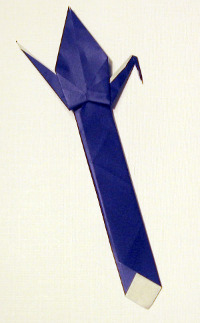 The use of minimal cuts is common in traditional Japanese models. 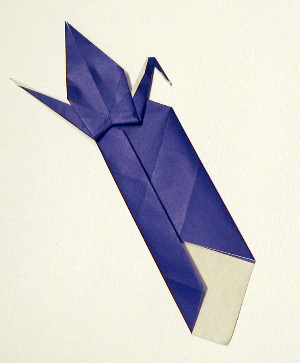 If you already know how to make a crane, you'll find it easy. 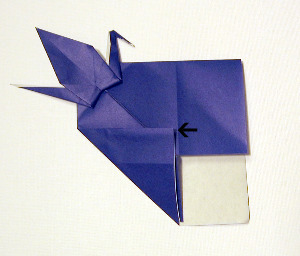 If you would like to practice making a crane first, click here. 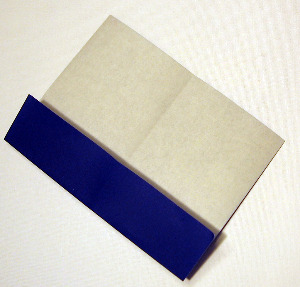 This origami bookmark would make a fine gift when made from beautiful paper, such as the Asuka paper in my store. 1. Start with the white side up. 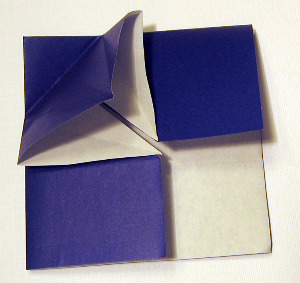 Fold side-to-side, unfold, and repeat, forming the creases shown. 2. Fold a side to the center crease. Note: You will unfold many of the next steps, but I don't show it every time. Watch for the word "unfold" in the step. 3. 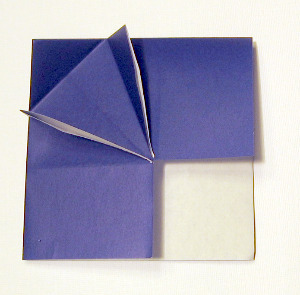 Fold an adjacent side to the center crease. 4. 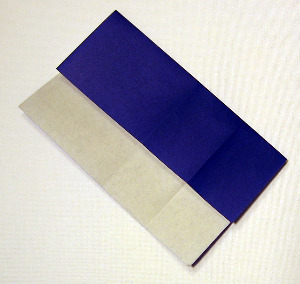 Fold one of the remaining sides to the new crease opposite it. 5. 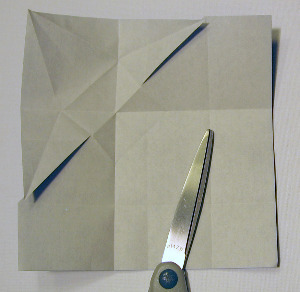 Fold the remaining side to the opposite crease. 6. 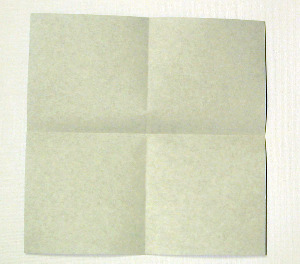 Notice the creases that form a large square. 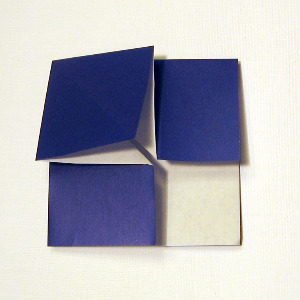 The next steps refer to this square. 7. 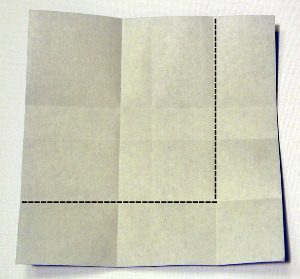 Turn the paper over and fold the square in half, corner to corner. 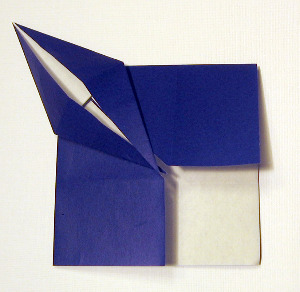 Fold to the point indicated by the arrow. In the next step you will make a crease indicated by the dashed line. 8. 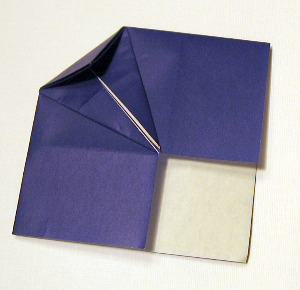 Turn the paper over and fold the square in half again. Crease only to the line you made in the last step. 9. 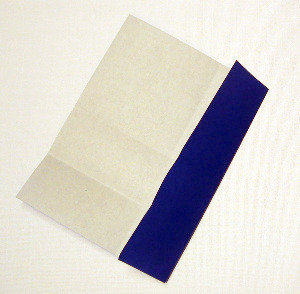 Using existing creases, fold in the two sides adjacent to the square, resulting in the small white square (lower right) and a flap sticking up. 10. 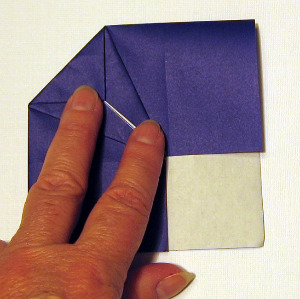 Squash-fold the flap into a square base, using the creases you made in Steps 7 and 8. 11. 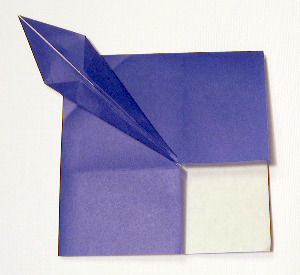 Fold the cut edges of the square to the center line, forming a kite shape. 12. 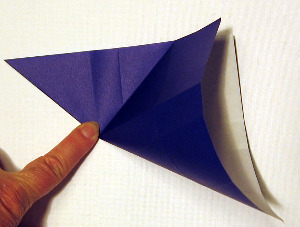 Fold the top of the kite down. Crease well. 13. Notice the crease lines marked with dashes and the small square between them. 14. Cut on the dashed lines, stopping at the square. 15. Refold and re-crease the kite folds. 17. 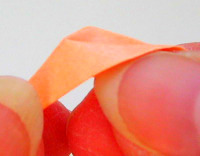 Peel up the top layer. 18. 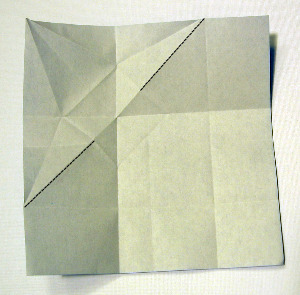 Use existing creases to fold into a crane base. 19. 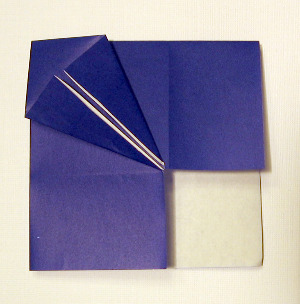 Fold the two lower sides of the base to the center line. 20. 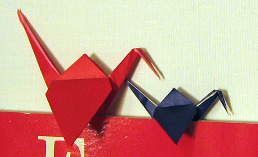 Fold the tail and neck of the crane, locking them behind the body. 21. 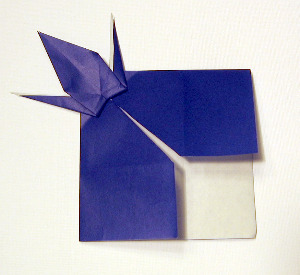 Fold the head using an outside reverse fold (see below), instead of the usual inside reverse fold. 22. The crane is done! Now we'll make the "stick." 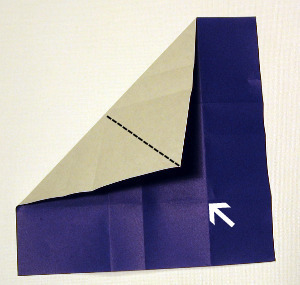 Fold a lower side to the crease line indicated by the arrow. 23. Repeat on the opposite side. 24. 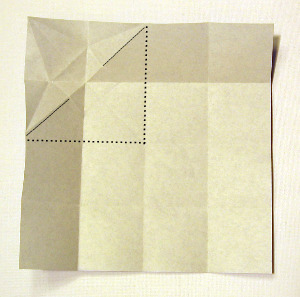 Fold the left side as far as it will go, keeping the edges parallel. Lock it behind the the crane's body. 25. Repeat on the other side. 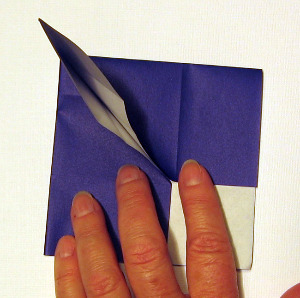 You can leave the wing up or fold it down. 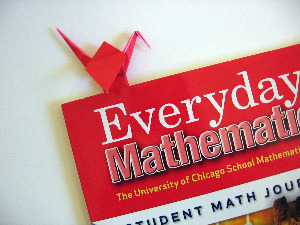 Enjoy using your origami bookmark! Want another challenge? 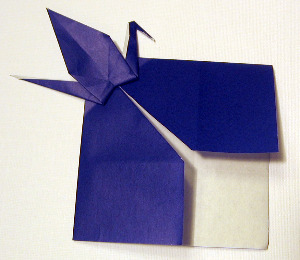 Try making cranes of different sizes, using the same size paper. Use this photo as a guide to the square to use to make your crane. All the other steps are exactly the same. 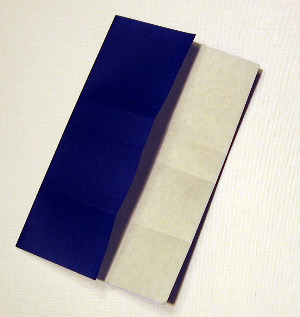 You'll just have more of the white side showing before you fold the "stick."